E-business process management (e-BPM) entails management of e-business processes with the customer initiating the process and involves non-linear processes with strong focus on value networks leveraging collaboration and alliances, rather than just business processes within the confines of the organization (Kim & Ramkaran, 2004). E-BPM requires organizations to take a process approach to managing their e-business processes (Smith & Fingar, 2003). The advent of business process reengineering (BPR) (Davenport, 1993; Hammer & Champy, 1993) resulted in numerous organizations initiating BPR programs. While BPR aims to enhance an organization’s process capability by adopting engineering discipline, e-BPM goes a step further and targets to improve the organizational process management capability (Smith & Fingar, 2004). Organizations target end-to-end business processes that deliver maximum customer value through e-BPM (Smith & Fingar, 2003). However, by their very nature, end-to-end business processes more often than not span multiple enterprises incorporating their individual value chains (Porter, 1985; Smith & Fingar, 2003; Smith, Neal, Ferrara, & Hayden, 2002) and involve e-business processes (Kim & Ramkaran, 2004). Integrating fragments of processes across multiple functions and organizations not only involves shared activities and tasks among business and trading partners, but also the capability to integrate disparate IT systems (Kalakota & Robinson, 2003). 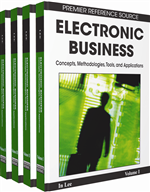 Effective management of e-business processes depends to a great extent on the enabling information technologies. In fact, Smith and Fingar in 2003 have stated that BPM is about technology. Porter’s value chain is about end-to-end business processes needed to get from a customer order to the delivery of the final product or service (Porter, 1985). The pervasive use of technology has created a critical dependency on IT that demands for a specific focus on governance of IT (Grembergen, 2004). Explicitly or implicitly, organizations specify business activities as business processes, and without realizing these tend to be e-business processes. However, given the current business conditions and a clear understanding by organizations about the complexities of their e-business processes, management of e-business processes is taking center stage (Smith et al., 2002). In the current business scenario where e-business processes, along with information are considered key organizational assets and management of business processes a strategic capability (Kalakota & Robinson, 2003), it is imperative that organizations clearly delineate the need for relevant and pertinent information as it provides visibility and transparency. Additionally, IT being the single most important predictor of the business value of IT (Weill & Ross, 2004) drives the need to analyze and understand the implications of e-BPM on IT governance. The key objective of this article is to investigate the implications of e-BPM on IT governance through the analysis of available literature. In particular, the article argues that a direct influence of e-BPM on IT governance performance is inevitable. While the importance of both effective e-BPM and IT governance is intuitively clear, there is currently little research on elements of IT governance that get enabled by e-BPM. More importantly, there is the lack of a theoretical framework that could be used to analyze. To address this shortcoming, the article also presents an analysis framework. The analysis framework is particularly useful as it incorporates elements from prevalent IT governance frameworks. Using the analysis framework, the article then examines the implications of e-BPM on IT governance and develops research propositions. The aim of developing the propositions is to enable further investigation and research thereby contributing to IT management theory.